Esther Agbarakwe, Abuja: “Nigeria is committed to sustainable economic development. The Lagos Event is a concrete step in the process of developing and issuing our 2017 sovereign green bonds program.” Amina Mohammed, Minister of Environment. Nigeria’s aspiration to become a green economy inches closer as The Federal Government meet investors and Capital Markets Operators in Lagos for the first ever Green Bonds Conference. Themed “Green Bonds: Investing in Nigeria’s Sustainable Development”, the Conference is organized by the Federal Ministry Environment in collaboration with Federal Ministry of Finance and Debt Management Office and will take place on Thursday, the 23rd of February 2016 at the Nigerian Stock Exchange, Lagos. The Acting President, Professor Yemi Osinbajo will deliver a keynote presentation at the conference. The Governor of Lagos State, H.E Mr Akinwunmi Ambode and The Governor of Ogun State, H.E Ibikunle Amosun will also attend as special guests. The Conference Agenda is expected to have Panel Discussions, an exhibition and presentation of the identified projects in Energy, Agriculture, Transport (FCT) and Environment with international investors and business leaders expected to lead at the event. The Sovereign Green Bonds project is part of a strategic process by the Federal Government to add to the nation’s funding options to catalyse the rebound of our economy and offer the vast majority of Nigerians, a new alternative. The Green bonds issuance will be the first stage in enabling Nigerian tap into the growing global market for green bonds, which as of end of 2016 comprised of $576bn of unlabeled climate-aligned bonds and $118bn of labeled green bonds according to Climate Bonds Initiative in London. “A sovereign green bond represents a new stage in development of Nigerian capital markets and opens the way for further corporate issuance and international investment. The NSE is playing a key role to help develop this enormous opportunity for Nigeria and fulfill one of our key objectives as a member of the UN Sustainable Stock Exchange Initiative,” says Oscar N. Onyema, CEO Nigerian Stock Exchange. Nigeria’s first green bond issuance will be the first ever Sovereign issuance in an emerging market. 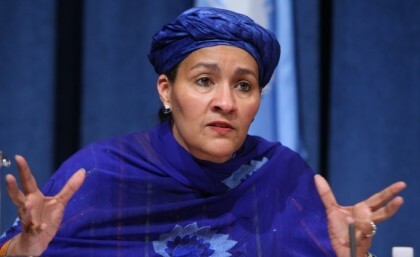 According to Amina Mohammed, Minister of Environment, Green Bonds Project present such an opportunity and the investors conference for Nigeria’s first green bond issuance is timely. The Conference present a huge opportunity to discuss next step in the diversification of our economy and it will bring together institutional investors, banking finance and young social entrepreneurs that will ensure this initial bond launch is a success enabling the development of a green bond market while building our national climate finance capabilities. The Honorable Minister of Environment and her counter-part, the Honorable Minister of Finance, Mrs Kemi Adeosun had on 12th of January 2017 inaugurated a Public Private Advisory Group meeting on the Green Bonds, this was consolidating Stakeholders’ consultation held in late 2016. Sponsors and supporters for Thursday’s event include the Nigerian Stock Exchange, CITI Bank, Chapel Hill Denham and Climate Bonds while the World Bank, DFID and EY are also playing active roles. The involvement of the NSE and international groups is another indicator of the longer-term climate finance objectives that lay behind this issuance.